New management methods, it's fashionable! Agility, Scrum, etc. There is a new one every year that floods our mailboxes; our news feeds on LinkedIn and the like. We are the first to want to change the world of business - we don’t recognize ourselves as old hat- nevertheless, we refuse to follow the crowd and whatever trendy is, fashionable, to sustain our corporate culture but also because it isn’t productive to change the way we work every year just because it's "trendy". By observing these ideas more closely, we can still recognize some common aspects. Although others may present differing methods, the outcome is still to create a strong, guiding and unifying environment for people to thrive, perhaps then the technique isn't the critical part, but the outcome, that we are all working towards a shared goal across business sectors. The key to success, therefore, acknowledgment that working methods are not set in stone but it's the consistency and goals that are important. The technique is not a holy rule that shouldn't be questioned, and on the contrary, it should be. Many people don't like change, and they thrive on consistency, we love routine, but this isn't always the best way to be. The simplest example: When a person is disappointed or angry, something will inevitably has triggered him. This trigger, like his reaction, is rooted in his education, his story, and so on. These reactions are entirely consistent with the trigger, and they will evolve (again with consistency) thanks to his experience. Consistency is, therefore, an extremely personal and hard-to-model concept. In the case business, it is the collective corporate understanding that allows the emergence of group understanding. It seems simple if only it were. However, taking consistent action in a company or team is not always an easy task. To take coherent measures is to use the experience of a team to advance the group while being attentive to its values, its history, its culture. Contrary to what one might think, it's not about the actions of one individual, the affirmation of a hierarchy or the tier system but rather the what's best for the group, working as a cohesive unit towards shared goals. What kind of unit would the group be if a strict manager arrived in an open and relaxed team environment? Consistency is a journey and conditional to all members adopting the same mindset. The first step is to be free from the ego, by all team members. By putting common values at the forefront all the answers and decisions become fair and unbiased. It is no longer a question of knowing if this or that idea is better than another one but of knowing if this idea would allow the collective to advance. It's essential to align the skills and capabilities of each member following their desires, goals, and ambitions in and out of the company. This consistency does not apply to managers, executives, supervisors, etc. It allows everyone to become known for his or her achievements. In a team, some people will be more adapt to design; others will shine on operations or strategy. Consistency, therefore, pushes everyone to take responsibility and act accordingly. If my ideas are about graphic design, I would rather go to the person who has graphic skills before bringing the project to my manager. In this context, the manager/leader becomes a facilitator rather than a decision-maker as the results we a collective effort. He attends the discussions and guides the members of his team rather than pointing fingers and pushing people in less desirable directions. The idea is to create a collective with consistency, innovation and the sharing of ideas as the foundation. Coherent action is not an insignificant act, we all tend to react to situations instinctively, reactively, therefore things can become personal! Preparing for a cohesive action, thus, becomes a state of mind, a way of approaching all situations, a method of thinking. It is imperative to step back in all circumstances to be able to bring out the best. Through this concept a team instinct emerges, everything is a joint process. This also helps to harmonize the work. In our customer experience team, we want all our customers to be treated with the same attention. This process, therefore, helps us to get the desired result collectively. 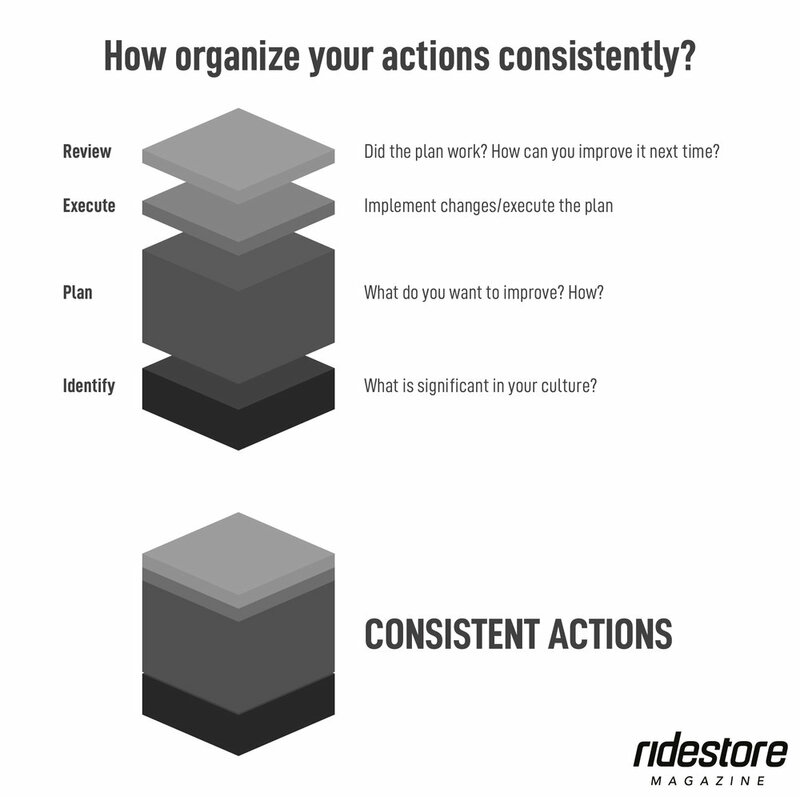 The consistent group action is a true methodology, and it is essential to have a perspective on a situation and to take action to be able to help it evolve. By addressing all topics in the same way, the results will only improve. Why consistency is the only rule, you need to follow. Creating a common thread has a renewed interest for a team. It allows everyone to move in the same direction, to know when, how, where, etc. things will happen, whatever the circumstances. This also limits the number of bad surprises, and even when they arrive, the team can come together, find the source, understand the issue and how it happened, nib it in the bud and move on even stronger than before. It's always hard to know where you will best fit in when looking for a new job. The company culture and understanding make it possible to optimize the message with potential future employees. It is easier for them to project themselves but also to understand what will happen once one becomes established in the company. Deploy your authentic informal leaders. When expectations are clear, it is easier for motivated employees to become the drivers within their team. Future promotions do not depend on a choice from above, but on people who unite the team and improve results while respecting the values of the company. However, are you sure you can't do it more? Sticking to these values is massively important concerning internal affairs, but also it creates a secure and trusting perspective for customers. Indeed, the message conveyed across all departments of the company will then take shape through the actions of these different factions. Members of the customer community will receive a consistent message that will support and strengthen their perception of the company! The company can also become cemented in its sector much more efficiently. Consistency is a way of organizing, to share between different people; however, it is not fixed! Through their exchanges, their actions, the feedback received, these people will change the rules regularly! For more efficiency, it is necessary to get out a little bit of his bubble, to learn and develop his critical sense (to avoid falling into the fad)! For me, reading is probably one of the most effective ways to access wealth and a plethora of information. When it comes to reading cookbooks, mountaineering, entrepreneurship, personal development... There is always something new to learn.